Having a digital camera is a necessity in this day and age. You never know when you’ll have to take clear, high-quality digital photos, so having a digital camera is a must. If you need to take pictures of a vehicle after a car accident for car insurance claims, the digital camera is a godsend. You don’t have to spend a lot of money on a digital camera, either. Here are five of the best digital cameras for under $200. In terms of hardware, the Nikon Coolpix brings a lot to the table. Featuring a 16 megapixel CCD, a 7x wide-angle lens capable of 28-196mm optical zoom, a high-resolution 3′ rear LCD display, HDMI output, and the ability to record 720p video, it’s tough to find a more powerful camera for the money. It also boasts a 4-way VR Image Stabilization System for taking crystal clear shots even if you’ve got a shaky arm. The nice thing about the Nikon is that it comes with a standard lithium-ion rechargeable battery. That negates the need to use rechargeable alkaline AA batteries, as some other point and shoot cameras require. The touch-sensitive rear LCD allows you to line up your shots and snap photos without having to click any manual buttons. With ISO speeds that range up to 3200, it’s perfect for taking terrific photos in any light. Even professional photographers love the Nikon Coolpix as a convenient backup camera for all purposes. One of the slimmest entry-level budget cameras around, this Samsung is a mere 17.0 millimeters thick. In spite of that, it still manages to pack 5x zoom, a 16.2 MP CCD, a nifty 3′ Touch LCD rear display, 720p HD video recording at 30 frames per second, and a slim rechargeable battery into one svelte package. While the hardware components of the Samsung EC-ST95 are impressive, the software programs included with this camera are the main reason to buy it. 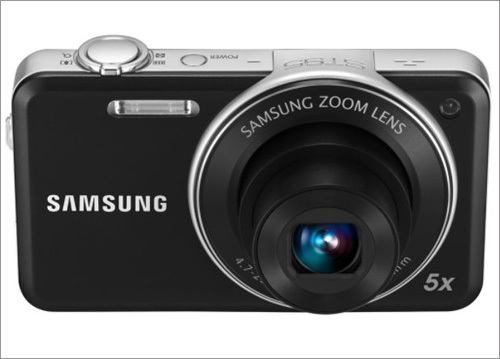 Like other Samsung budget cameras, the EC-ST95 comes equipped with Smart Auto 2.0. It’s an intelligent picture analysis and shot composition program that adjusts your camera settings based on a number of different lighting and environment variables. Basically, it allows you to take great photos on the fly automatically without having to stop and configure every little setting. It picks one of 4 movie shooting modes or 17 picture modes that are pre-configured by default to take the best picture possible. While the PowerShot ELPH 300 HS has the lowest megapixel count of any camera on this list, it’s capable of taking incredible photos nonetheless. With a 12.1 MP CMOS, the famous Digic 4 image processor, 5x optical zoom, a 24 mm ultra wide-angle lens, 1080p HD video shooting capability, a slew of shooting modes and ISO settings, 2.7′ LCD display, and manual buttons on the rear, it’s certainly not lacking in features. The real story with the PowerShot ELPH 300, however, is the superb back-end software that comes standard with your purchase. It features an unrivaled 32 pre-configured shooting modes, high-speed shooting with its 8.0 frames per second Burst Mode, Dynamic IS image stabilization, a special Super Slow Motion Movie shooting mode option, and more. 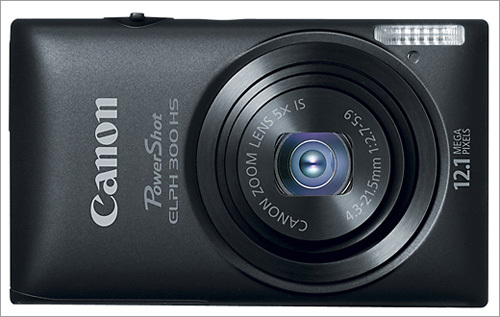 The Canon PowerShot ELPH series proves beyond a shadow of a doubt that megapixels aren’t everything nowadays. 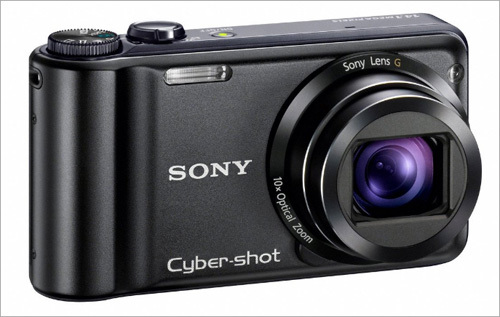 The Cyber-shot from Sony is an option that isn’t considered as often as Canon or Nikon models. Sporting a 3′ rear LCD display, a 14.1 MP CCD sensor, remarkably stable 720p dynamic video capture, 10x zoom, a highly capable 25 mm optical lens, and an advanced BIONZ image processor, it’s as powerful as any of the more recognizable cameras in the entry-level category. ISO speeds go all the way up to 3200, making low-light shooting a breeze. The Cyber-shot has a number of Sony-specific software features like Intelligent AF and Smile Shutter which make snapping photos under challenging conditions easy and hassle-free. It boasts a PHOTOMUSIC function that lets you create slide shows of your pictures set to soothing tunes. The Cyber-shot also allows users to retouch and modify their photos directly on the camera before they transfer the files to a PC. The Panasonic Lumix comes with a 14.1 MP sensor, 8x image-stabilized optical zoom, a 2.7′ rear LCD display, a 28 mm wide-angle lens, and an efficient Venus Engine IV image processor. Running off of a rechargeable lithium-ion battery, the Lumix offers superior battery life thanks to intelligent power management. Nearly as slim as the Samsung EC-ST95, the Lumix is every bit as versatile and powerful as any of its budget competitors. The HD video recording feature is capable of capturing 1,280 x 720 pixel resolution at 30 frames per second. In addition, the Lumix features an iA Intelligent Auto mode that makes for quick shooting that doesn’t compromise quality for speed. The battery allows for up to 300 shots per charge, so you won’t find yourself running out of juice in the middle of extended photo sessions. 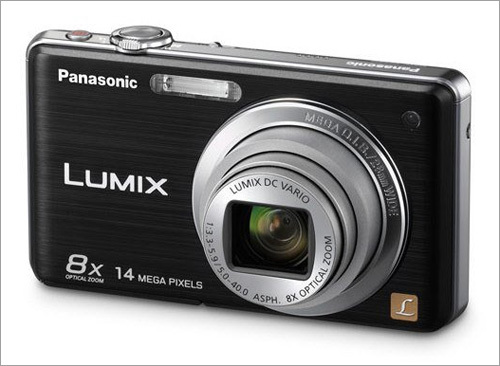 On top of all that, this Panasonic is one of the most stylish entry-level digital cameras on the market today. With each passing year, the dependability of digital cameras improves substantially. At the same time, the amount of money you have to shell out to get a respectable level of performance continues to fall. The main thing to remember when buying any digital camera is to choose a reputable maker, like Canon, Nikon, or Sony. They all have a reputation for quality for a reason, so you should err on the side of caution and go with a name you trust. By the way, you can review the list of the most expensive photo cameras ever. Be sure that these cameras will brake your ground. About the author: Jennifer Mathisen is a freelance writer with a passion for photography. She enjoys spending time researching for the latest cameras. When she is not looking up the newest cameras, she likes to compare auto insurance online to find the difference between car insurance rates by state.